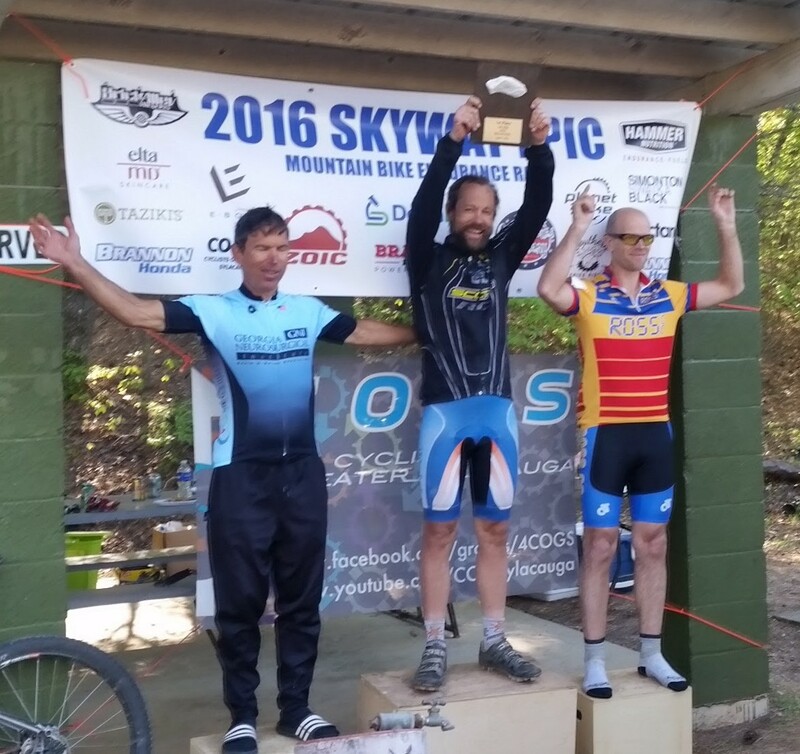 Skyway 2016 100 mile podium. Left-to-right: Jeff Clayton, Brian Toone, and Hefin Jones. I was freezing cold after the race so I donned a skull cap and my winter jacket thinking I’d take it off right before the podium but then my zipper was stuck and I couldn’t get the jacket off. Oh well!!! Shout out to my team Friends of the Great Smokies. I’m happy to report a win – my first win in a long time – at the 2016 Skyway Epic 100 mile mtb race. Race director Brent Marshall introduced a new format this year where the 100 milers got a 2 hour headstart on the 60 milers so that we could all finish at the same time. This was super helpful to me as I caught 60 milers later in the race which gave me motivation to push it hard since I was no longer alone out there on the trail. Unusually cold weather saw us start with steam rising off Lake Howard and temps dipping all the way down to freezing at the start. Chilly 32 degF at the start of the 2016 Skyway Epic 100 mile race. At the start, I took off like a rabbit getting the holeshot with Jeff close on my wheel. I rode as fast as I could on the singletrack, but he wanted to go a bit faster so after the goat trail he came around and put a little bit of time into me on the remaining singletrack. I could see him up ahead any time the trail went uphill and I would close a bit by crushing the hill as hard as possible before he would put more time into me on the downhills and turns. I was still within shouting distance and quickly caught up on the doubletrack so that we entered the creek crossing together. Behind us came the lead singlespeeder who went flying by us on the steep hill on the other side of the creek as we spun up it in easier gears. Jeff and I took turns rotating on the front as we flew up and down the hills of Wiregrass road eventually catching the singlespeeder near the start of the long cat 2 climb to the top of Bull’s Gap. I pushed the pace really hard through here hoping to get as much of a lead on the climb as possible to be able to hold onto it on some of the tricky descents across the top. Immediately after the 1830′ high point on the skyway is a short, fast steep descent with large rocks and ruts. You have to find a good line, and I did not. I just plowed over everything. I didn’t take this as a good sign, or perhaps it worked out to be a good wake-up call as I took really good lines the rest of the day. This stood out to me as one of the best parts of the race — the tricky uphill climbs with rocks and ruts where you normally dread bouncing over the smaller rocks and losing momentum. Normally, I weave all over the place trying to find the perfect line. But this year I decided to take a more direct approach. Sometimes it was clear that the best line was on the side of the trail. But other places, the best line was right through the middle of the rocks where I discovered that many times there would be a small gap where you could ride between rocks or the rocks would be smooth enough that it was less energy to ride over them than to try to maneuver across to the other side of the trail. Also, I tried to make good use of the updrafts on some of the climbs. If the climb was smooth enough, I would lock out the fork, stand up, and do the top of the climb standing up to maximize surface area from the wind blowing up the climbs. Then as soon as I reached either a bumpier section of the climb or the top, I would unlock the fork so that I could have the security and efficiency of the front tire staying on the ground instead of bouncing up in the air. I was happy with a few of the descents, but it is tough with a hard tail to feel secure enough to rail the corners knowing that your wheels could bounce up and wash out. USGS map (2014) showing the second section of the skyway up Talladega Mountain from the RR crossing in the bottom left to the Gunterstown Rd crossing at Clairmont Gap in the upper right of the map. Click to enlarge and find cemeteries on the map. 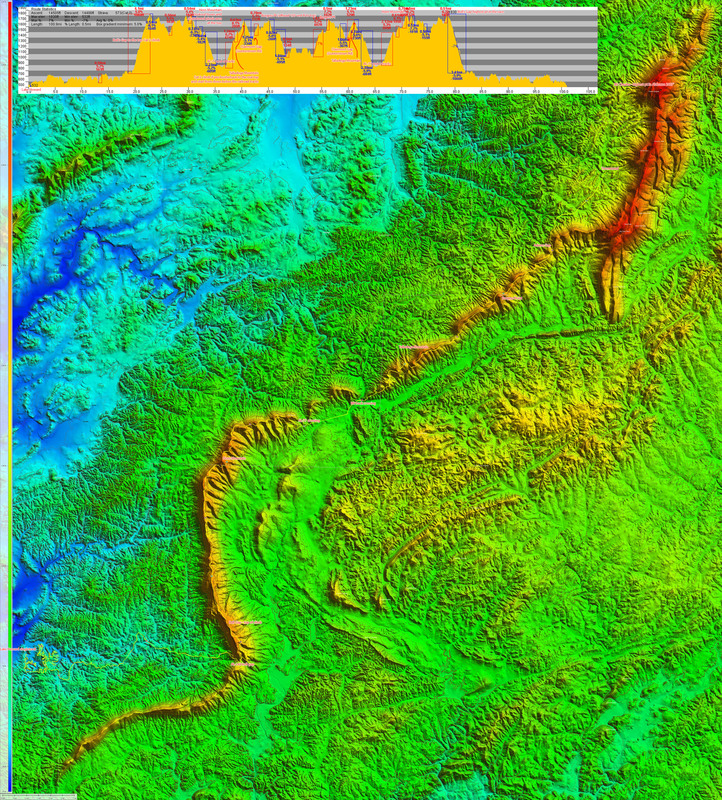 Talladega Mountain is not in the USGS summit database (probably an accidental omission), but it is labeled on the USGS printed maps – both the old ones and the new ones. But because it isn’t in the USGS summit database, the label doesn’t show up on Google Maps terrain view, Openstreetmap terrain view, or my topocreator maps. But when Brent posted the map of the race course outlined on a scanned USGS printed map, I saw the name of it plastered right there on the map over the entire ridgeline making up the Skyway-2 section of the race. This entire stretch of the skyway is a 4 mile climb up Talladega Mountain followed by a shorter 1.5 mile descent down to Clairmont Gap. This section of the skyway is not quite as well maintained. Others may be able to speak to this better than I, but I imagine the reason why the first section is better maintained is that there is a lookout tower and abandoned picnic area at the top of Horn Mountain on the first section of the skyway. I imagine 20, 30, 40, or 50 years ago it was probably a popular outing from Talladega or Sylacauga or even Birmingham to drive down and then drive up the dirt road to the tower. Talladega Mountain, on the other hand, doesn’t have anything at the top. This section of the skyway simply serves as a rugged shortcut to get over to Gunterstown, but there is a paved road through the valley that is much faster so there is no real reason to maintain this section of the skyway other than as a fire road for the national forest and the Pinhotti trail, which crosses it a couple times. The end result is these awesome, massive ruts right down the middle of the road. These are not ruts from vehicles, but rather a single rain channel rut. It is deep enough in places that if you get stuck on the wrong side of the rut, you have to climb off and hop over to the other side. This happened to David Potter and I last year during the race. This year I was able to guess the correct side and correct place to cross the ruts and didn’t have to hop off, although I think there was one place that was really tight that I squeezed through barely. Also, on the climb up Talladega Mountain, which starts immediately after the RR track crossing, I heard the train horn and was hoping that I was far enough ahead that everyone else would be caught behind it and have to wait. I think I had been on the climb for 5-10 minutes, though, so it’s likely that Jeff was already on the climb. It must have been a close call, though, as my gap was 6 minutes at the next aid station a few miles later at the Gunterstown crossing. The third section of the skyway is really well maintained as there is some private property in the middle of it not too far from Burgess Point. I imagine there was a clause written into the law which created the Cheaha Wilderness and Talladega National Forest that existing property owners could keep their land. There were “for sale” signs along the skyway. The entire section is road bikeable and makes for some great Rouge Roubaix training. On a mountain bike, you can absolutely fly through here although there is some loose gravel that is just deep enough to offer extra resistance but not enough to cause fishtailing on a mountain bike. On a road bike, be prepared to take good lines and avoid the deeper gravel or you are going down! One of the ways that I trained for Race Across America was to ride out to Cheaha and back. Visible at several spots along my normal routes out to Cheaha is the skyway epic ridge line, which I would almost always cross at either Gunterstown or Adams Gap or both. The shortest possible distance for any of these rides from my house in Hoover is 180+ miles. Gunterstown and Adams Gap and the main Cheaha highway (AL-281) are all on those routes and also on the Skyway Epic race course, but sections 1 and 2 are not road bikeable so my only association with the first two sections of the skyway are with the race itself. This third section of the skyway and the Cheaha parkway are deeply ingrained with memories from super long road rides. This can be both a blessing and a curse. The blessing is that it makes for some fun memories and distraction from the pain during the race. The curse is that I’ve been on those roads when I’ve been way past the point of exhaustion so during a race on the same roads you do have some negative reinforcement as you are trying to dig even deeper into the pain cave. The turnaround was at the Pinhotti trail parking area near the turnipseed primitive campground entrance. This is where I parked my car when I everested Mount Cheaha from the west back in December 2014. At the turnaround aid station, I dumped my trash and ate my first powergel and hammer gel. I didn’t get any water as I still had a full bottle of gatorade. I figured I would drink this until Aid Station #3 on the way back up Horn Mountain. This was a bit of a mistake as it had gotten hotter and I ran out of gatorade before making it to the aid station. Still, it wasn’t long that I had to ration and I was able to refill at Aid #3. Altogether because of the cooler than normal temperatures, I only drank three bottles – 60 oz total – of fluid during the 7 hour 24 minute race. At the turnaround, I hit my lap button so I could time how long it was back to Jeff. My timer hit 4’45” when I passed him heading the other way. I kid you not – I spent at least 20, maybe 30, minutes trying to figure out what that translated into in terms of an actual time gap based on the terrain he was traversing (mostly downhill) vs the terrain I was traversing (mostly uphill). My estimate of the time gap was 6-7 minutes, which I think was pretty close based on the splits Stewart Miller had written down at aid station #4. I was starting to feel more confident that I was pulling away, but there is no real way to know for sure so I just kept on it as hard as I could. I was encouraged every time I saw my heartrate make it back up into the 160s on a climb. Also, once I hit the 65 mile course turnaround I started seeing and passing racers again. This was encouraging and motivating as many of them shouted encouragement as I passed. My goal was to bury it as much as possible before the singletrack knowing that even if I was exhausted I would still be able to ride the singletrack at about the same speed because of all the turns. I also wanted to have as much of a gap as possible so I could take the singletrack at a safe speed and not crash and make things worse. I also wanted to pick good lines on the singletrack to avoid the sharp tire-slicing rocks. Still, I was coming around a corner and hit something, and I immediately I heard the “psffffft” of air leaking from my rear tire. Also, I felt tire sealant splashing on my back. I kept riding hoping that the tire would seal itself, and it did! I was low on air in the rear tire so I rode even slower on the singletrack to make sure that I didn’t get a second puncture or cut on the tire. Finally, after an hour of singletrack, I made it back to the start in first place!!!!!!!!! Click on past years to see the race report for that year. Also, last year’s temp swing is correct as measured by my Garmin in the full sun on the climb back up Horn Mountain since there is no shade. Actual air temp was probably in the 80s degF. Last year’s race was by far the hardest because of the heat and distance and having ridden to the start from Birmingham and then attempting to ride home afterwards for 185 miles on the bike that day! Annotated heartrate zone summary from the 2016 Skyway Epic 100 mile mtb race. I hit my lap timer at the halfway point so I could time my gap to Jeff. The side effect of this is that I’ve got my exact outbound vs inbound times for the race – 3:46:58 (13.2 mph) on the way out and 3:37:38 (13.9 mph) on the way back in. Annotated HR plot from the 2016 Skyway Epic 100 mile mtb race. Click to enlarge and see detail. Finally, here is an annotated topocreator map of the entire Skyway Epic ridge line up to Mount Cheaha. Click to enlarge and see detail. 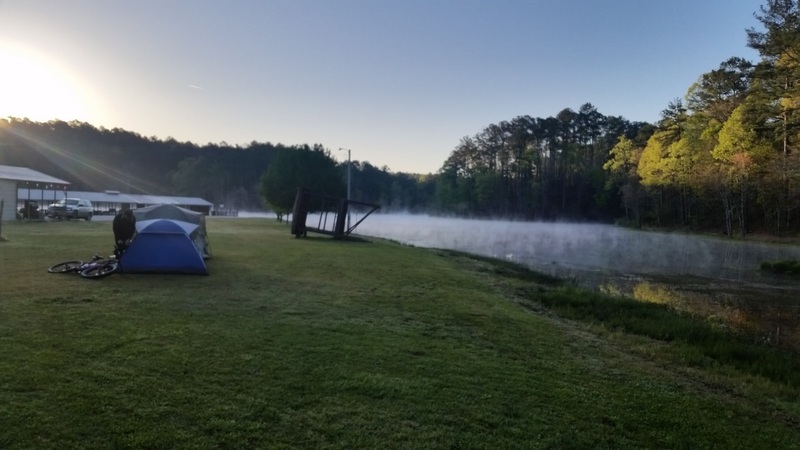 Having gotten up early to get to the 7AM start on time, I went to bed pretty early Saturday night and set my alarm for 2:30AM so I could ride the 71 miles from Birmingham to Romulus (west of Tuscaloosa) for the Tour de Tuscaloosa road race. I was very slow getting everything ready and didn’t make it out the door until 3:48AM. I had to book it to make it there in time but fortunately there was a southeasterly wind blowing which was a crosswind at the beginning and cross-tailwind by the end. I averaged close to 17 mph on the way there and was going to be there in plenty of time, except I got confused about where the registration was. I thought it was at a church near the intersection of 5 mile Dirt Rd and Romulus Rd. So I panicked and eventually just started riding around like a chicken with its head cut off in all three possible directions from that intersection. With no cellphone coverage I couldn’t look anything up either so I gambled after briefly checking the two options I thought were least likely and committed to the third option which I knew took you into the main part of town. I made it to the registration desk by 8:16AM for the 8:30AM start. I was preregistered so all I had to do was pin two numbers onto my jersey. By the time I got my numbers on and took all my extra lights off my helmet and bike, I rode straight up to the start where Stuart Lamp helped me ziptie the timing chip to my seatpost immediately before another official gave us our final instructions and sent us on our way. Perfect timing! I put in the first attack after the neutral zone hoping that people wouldn’t take it seriously and I would be long up the road by the time the real break went and caught up to me. Unfortunately, that didn’t work so well and I drifted to the back missing the real break when it eventually went. There was a great chance to bridge up on this hill near a church, but nobody attacked and I was blocked in. In fact, I almost had a clear shot at it but I would have had to cross the yellow line to clear one rider who was just a fraction too far to the left for me to squeeze between him and the yellow line. Ugh. Probably for the best, though, because I felt terrible later in the race and I think it would have been even more depressing to get dropped from the winning break rather than miss the break altogether. All-in-all, it was a fun race and really great to see racers I haven’t seen in a while. One really special reunion was chatting with Trey Pounds who I had met and stayed with on my ride back from Natchez, MS to Birmingham, AL as a test run to test the feasibility of me racing RAAM. Annotated heartrate from the Tour de Tuscaloosa road race plus the ride there from Hoover. This entry was posted in Adventure, Racing and tagged data, statistics on April 11, 2016 by kartoone.